Welcome to our hometown theatre, the Historic Playhouse at White Lake, presenting fine arts and entertainment to the greater West Michigan area since 1916. Announcing Our 2019 Summer Theatre Festival! The Playhouse at White Lake is pleased to announce our 2019 Summer Theatre Festival! We are thrilled to be back in our own space this season and look forward to welcoming you to our newly renovated and expanded theatre. The 7,000 square foot expansion includes a new box office and concessions, large accessible bathrooms, a 1,500 square foot lobby, rehearsal space and dressing rooms. The original theatre space includes new carpet, seats, sound and lighting equipment as well as new stage rigging and drapery. With patron comfort in mind, the heating and cooling systems have been upgraded to high-efficiency units allowing for year-round programming. We are grateful to this wonderful community for their enthusiastic support of this 102 year old theatre and their generosity of spirit and treasure to keep it vibrant for the next 100 years. We are currently transitioning to a new ticketing agent. During the transition, only Season Pass sales will be available online. Individual ticket sales will be available as soon as the transition is complete. Just like the lyrics from the 1964 song by Bob Dylan, the time has come for our beloved theatre to have a new name. Since opening in 1916, the theatre has had many different names including Whitehall’s Community Theatre, the Nufer-Adams Theatre, in the ‘50s and early ‘60s it was known simply as The Playhouse. Following the last renovation in 1973, the theatre was re-named the Howmet Playhouse in recognition of Howmet Corporation’s financial support of the community’s fundraising campaign. After months of construction, we will re-open the theatre with a new name: The Playhouse at White Lake. The original architects embraced the craftsman style and we are carrying on that feel both inside and out. The color schemes are warm, traditional craftsman colors that reflect the time in which the playhouse was built. We have chosen to incorporate the dragonfly, a well-known symbol in the arts and crafts movement, into the logo. The dragonfly, in almost every part of the world, symbolizes change that has its source in mental and emotional maturity and the understanding of the deeper meaning of life. We strive to present music and plays that expand our view of the world and brings us closer together as a community. The fact that we can enjoy beautiful White Lake just outside our doors and the abundance of dragonflies along her shores was just one more reason to adopt the symbol. 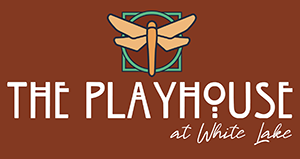 We look forward to welcoming you to The Playhouse at White Lake. The Playhouse is an integral part of the White Lake Community. Why? View the video celebrating the centennial of the Playhouse.